Amir 3 in 1 HD Clip-on Cell Phone Camera Lens Kit, can be used with a wide range of cell phones such as for iPhone 7/6/6 plus/5/5S/4/4S, Samsung Galaxy and more; work on iPad and PC too. Professional but portable to use. Simply clip it on the front or back camera of your phone, and it will show you another world of cell phone photography! Everyone can be a photographer of your life! ▲ Macro Lens and the fisheye Lens are attached together while you receive them. When use macro lens, please unscrew the fisheye lens first. If you’ d like to use the fisheye lens, please attach the macro lens together to get funny pictures. ▲ All three angles would not block the flashlight even though the edge is right next to the flash light. ▲ Clean the lens before using them and put on the covers when finish taking photos to get a clearer picture for the next time. 3 in 1 HD Lens - Including superior quality 0.4x Super Wide Angle Lens + 10x Macro Lens + 180° Fisheye Lens, they can always meet all you demand on photography. Enjoy the high quality and incredible images. High Clarity & Professional - Made of high-class glass and solid aluminum, these professional HD Lens reduce glass flare & ghosting caused by reflections. Covered by lightweight and strong shell, PVC made clip, these tiny clip-on detachable HD lens are professional but easy to use. 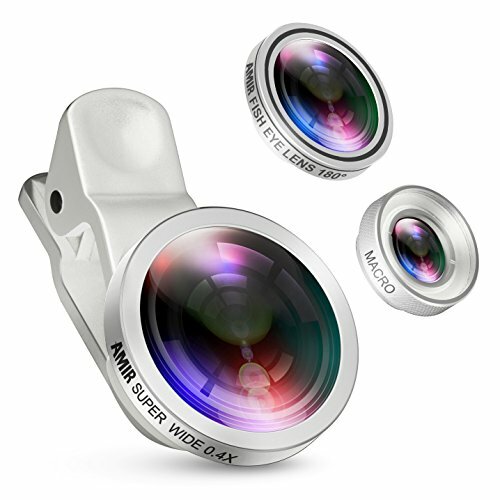 Portable & Universal - Portable and detachable universal lens clip design, slinky silver appearance make it the fashionable and useful gadgets to take away with. Total Compatiblity: Fit for iPhone 7/6S/6, iPad Air 2/1, iPad Mini 3/2, Samsung Galaxy Blackberry Bold Touch, Sony Xperia, Motorola, Android and any other smart phones. No need to bearing a heavy SLR in your tourism. No more time wasted when struggle to take a group photo. An AMIR 3 in 1 Lens Kit is enough. Please Note - The Macro Lens and the Fisheye Lens are attached together upon arrival. When you use the Fisheye Lens, please DO not detach the Fisheye Lens from the Macro Llens.